The Chow Chow is generally an independent and loyal dog breed who makes an excellent guard dog. 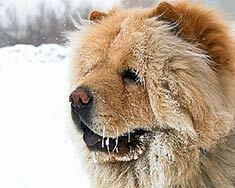 The Chow Chow has a thick, double coat, which makes him suitable for cold weather. This dog breed's most distinctive features are its almost straight hind legs and its bluish-black tongue. 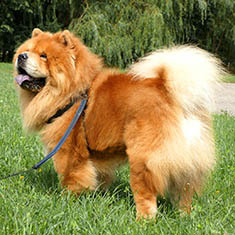 The Chow Chow originated in China. Chow Chows range from 18 inches to 22 inches. Chow Chows range from 45 to 75 pounds. There are five colors in the Chow Chow: red (light golden to deep mahogany), black, blue, cinnamon (light fawn to deep cinnamon) and cream. Chow Chows have either a rough or smooth coat. The rough coat has a longer and coarser outer coat, while the smooth coat has a shorter and sleeker outer coat. Both coats have a dense and wooly undercoat. Regular grooming is required. Extra brushing is needed during shedding season. The Chow Chow is an intelligent, independent and protective dog breed who tends to be loyal only to a few people. The Chow Chow can be unfriendly to people and very dog-aggressive. The owner of a Chow Chow should be confident and patient since the Chow Chow could be aggressive at times and resistant to training. The expected life span of the of the Chow Chow is 8-12 years. Chow Chows need daily exercise and attention. A house with a fenced yard is essential for this dog breed. The Chow Chow is in the Non-Sporting group. Who loves Chows? Martha Stewart, Peri Gilpen (Frasier), and even Sigmund Freud have lived with these ancient dogs. Freud once admitted that he depended on his dog to assess his patients’ mental state! In a nod to the breed’s Chinese origins, Martha Stewart named her dog Genghis Kahn! Chow's chinese name transaltes to "puffy lion dog." This beautiful entry in the non-sporting group carries the Chinese name songshi quan, which translates as “puffy lion dog”. It’s easy to see where that name comes from. 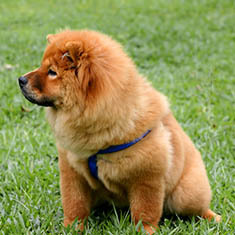 The Chow’s coat is very dense and is particularly thick around the neck, making it look a bit like a lion’s mane. The Chow is sometimes thought to be the original ancestor of the Samoyed, Norwegian Elkhound, Pomeranian, and Keeshond, all of whom carry the distinctive long-furred tail that lays curled up over the dog’s back. The Chow stands 17 – 20 inches at the shoulders, and the dog should be square when seen in profile, with the distance from the forechest to the point of the buttocks equal to the height at the withers. The average weight of a Chow Chow is 45 – 70 pounds. The average weight of a Chow Chow is 45 – 70 pounds. There are two coat varieties: rough and smooth, although both are double-layered. On a smooth coated dog, there is no ruff, and the outer coat is hard and dense. On the rough coated dog, the outer coat is more abundant and off-standing. In both cases, the undercoat is soft, thick, and woolly. Five colors are acceptable: red, black, blue, cinnamon, and cream. Reds vary from light golden to deep mahogany, while cinnamon ranges from light fawn to deep cinnamon. Blue results from a dilution of the black gene, while cinnamon is a dilution of red. Cream-colored chows typically cannot be shown because their pink to flesh-colored noses do not conform to the breed standard of a black nose. Buyer beware: When choosing a puppy, remember that the color of the adult dog’s fur may be different than the puppy’s. Also, you may have a tough time choosing just one of these puppies because they resemble little teddy bears as puppies. Just remember they’re all going to chew your shoes and grow into full-sized dogs! With all of that fur, the Chow, as you might imagine, requires some careful grooming. A rake brush and a pin brush should be used at least twice a week to keep the dog’s coat in good shape. The rake helps to remove any dead undercoat fur while the pin brush is used to keep the top coat shining and healthy. It’s important that you make sure to brush all the way down to the skin to prevent matting of the fur close to the body. Coat dressing such as mink oil spray can be applied to the fur to make brushing easier. Too much grooming of the ruff can strip it away, so care must be taken when grooming around the neck. 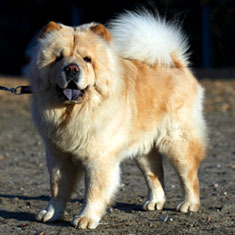 Chows will “blow” their coats in the spring and fall, requiring more frequent brushing to deal with the deluge of shedding. The double coat of a Chow Chow is designed not only to keep him warm in the winter but also to trap cool air in the summer. Regular grooming will remove dirt and debris packed into the fur which may prevent air circulation that is important to keeping the dog cool. If you keep up with the brushing, there is no need to shave the dog to keep him cool. In fact, shaving off the protective fur can be worse than leaving it in place. 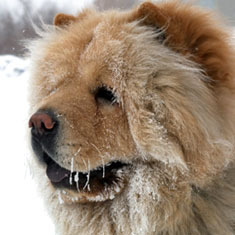 Like several other breeds, Chows are prone to the development of hot spots. They can appear in a heartbeat, and grow very quickly into huge, oozing sores. These spots are very itchy, and the more the dog scratches at them, the more painful they become. Hot spots can be the result of flea or insect bites, shampoo that isn’t thoroughly rinsed out, allergies, or hormone disorders. Your vet can give you an ointment to relieve the itch, or maybe even a steroid shot for severe cases. You may also need to restrain the dog to keep him from scratching and biting at the spot until it heals. Like all double-coated dogs, Chows will “blow” their coats in the spring and fall, requiring more frequent brushing to deal with the deluge of shedding. This alert dog is only moderately active and does not do well in excessively hot weather. A casual stroll in the cool of the morning or evening will meet his exercise needs, particularly in the summertime. Failure to train your Chow as a puppy can result in a grown dog with no respect for authority. Chow Chows were originally bred to hunt, herd, pull sleds, and guard the home, but are now most often kept as companion pets. They quickly become one-person dogs, fiercely protective of those they see as their family. Some insurance companies view them as high-risk because of their protective nature, although empirical studies of breeds involved in dog bite fatalities do not bear out the level of concern. 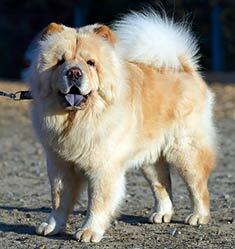 Chow Chows are very stubborn and somewhat resistant to training. It is much easier to get training and socialization done during puppyhood while they are more malleable. Failure to train your Chow as a puppy will result in a grown Chow who has no respect for you and refuses to accept your authority. The Chow Chow Fanciers of America have a very good primer on socialization of Chow puppies. Chows are generally well-behaved, non-destructive, and quiet. Somewhat aloof and independent, they are often compared to cats. This aloofness, combined with their protective instincts, means that they won’t greet all your friends with enthusiasm. They may also not care to be involved with other dogs, particularly those of the same gender. Chow Chows are susceptible to a number of health problems, the most common being hip dysplasia (a crippling deformity of the hip sockets) and entropion (a turning in of the eyelids that can cause blindness if untreated). Ask your breeder to show you an OFA certificate for both parents, showing them to be free of dysplasia, and ask for a guarantee against dysplastic hips for two years before you hand over your hard-earned money for a puppy. Entropion may be inherited or the result of an eye injury. When purchasing a puppy, look for the parents to have clear, dry eyes. Any crustiness or inflammation in your dog should be evaluated by a veterinarian immediately to prevent future blindness. Because of their short muzzles, Chows often have trouble with anesthesia and should be put under only with someone experienced with brachycephalic breeds. As mentioned earlier, Chows have trouble in high heat, particularly on humid days. If your dog is panting heavily with raspy breath sounds, it is an emergency. Wet the dog with cold water and wrap him in towels soaked with cold water. Place ice packs around him and transport him immediately to the nearest veterinary clinic. Would a Chow Chow fit into your home? Overall, these dogs are good for families that don’t anticipate providing a lot of physical activity, but the family must have time to do the early training and socialization required to prevent problems later. The family must also be willing to put up with excessive seasonal shedding and the associated grooming. People who would live with a Chow must be able to provide cooler conditions in the summertime and must investigate the insurance implications of having a breed some consider aggressive. Properly trained and socialized, these dogs do well in homes with no other dogs and with people who respect their dignity and independence. Find Chow Chow Puppies with our Free Breeder search!